A professor of public health has served up an early contender for the much coveted Most Preposterous Attack on the Drinks Industry 2019 award. Simon Moore of Cardiff University teamed up with counterparts at Oxford University to compare alcohol's benefits with issues like risk of depression, insomnia and cognitive decline. He then put out a press release saying that every bottle of wine you drink per week ends up costing you £2,400 a year. Details are sketchy as to why these researches think it costs £2,400 a year, as they simply state “in damage to health and quality of life”. A sum of £2,400 a year equates to £46.15 per bottle, which is pretty darn expensive when you consider the average price of a bottle of wine in the UK is £5.76. A bottle of wine per week leaves you well within the Chief Medical Officer’s widely derided weekly recommendation of consuming no more than 14 units. Yet these researchers claim that long-term damage to health, mental ability and relationships far outweigh any benefits of drinking wine. They added that pint of beer a week is equivalent to £610 a year, so anyone drinking 10 pints apparently loses £6,100. Drink five bottles of wine a week and you will be down £12,000 a year, according to the researchers, which is almost half the UK average salary. Rather than laughing off this lunacy, The Sunday Times gave it a prime spot in its fine organ, and The Mirror then published it too. The team said it analysed the health, wealth and lifestyle of 141,000 British drinkers aged 37-73 before coming to its conclusion. Yet the article was given short shrift by Sunday Times readers in the comments section underneath. Walter Ford said “I hope they’re paying their wine correspondent enough”, although there was no response from Will Lyons, who may have been asking for a raise. Chris Snowdon, head of lifestyle economics at the Institute of Economic Affairs, said: “This research, such as it is, is unpublished and there’s no way of knowing the methodology, so it comes down to whether you trust the researchers. “The only researcher named in the article is Simon Moore. We came across Simon last year when he was responsible for headlines like ‘half a glass of wine can raise the risk of dementia’. “The study claimed that drinking more than one unit of alcohol (half a pint of bitter) reduces cognitive function and therefore (it was questionably assumed) increases the risk of dementia. “It shows reaction times. Look at the weird x-axis. Also look at the difference in reaction times, which was tiny. “As David Spiegelhalter said at the time, ‘the authors’ conclusions are bizarre, to say the least”. 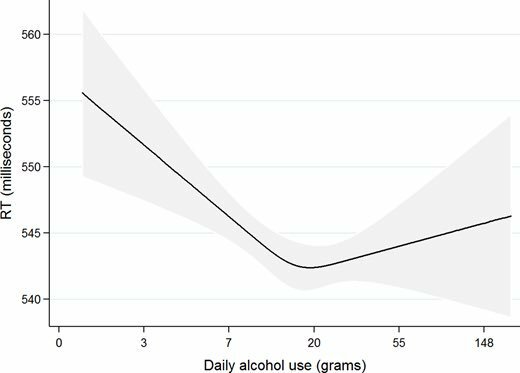 Reaction times were faster at two units a day than at one a day and even the heaviest drinkers had faster reaction times than the lightest drinkers. “There is plenty of evidence that moderate drinking reduces dementia risk. The reality is that half a glass of wine and more is beneficial. “Spiegelhalter is a very polite man so when he says ‘it would seem inappropriate that this paper, as it stands, is part of the scientific literature’, we should pay attention. “Since Moore grossly misrepresented the risks of drinking in that study, there is no reason to trust his back-of-a-fag-packet, unpublished cost-benefit analysis. Is drinking a bottle of wine really equivalent to smoking 10 cigarettes?